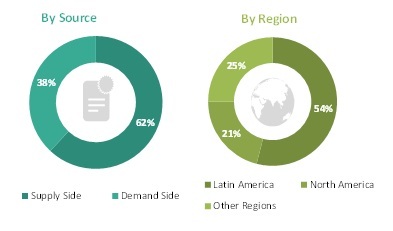 [281 Pages Report] The Latin America pharmaceutical excipients market is projected to reach USD 579 million by 2024 from USD 403 million in 2019, at a CAGR of 7.5%. Growth in this region is driven by the growing pharmaceutical industry in Latin American countries such as Brazil, Mexico, and Argentina; increasing focus of MNCs on investing in the pharmaceutical and healthcare sectors in Latin America; rapid growth in aging population & the subsequent increase in the prevalence of related diseases; and the availability of local and government funding for R&D activities. By functionality, the LATAM pharmaceutical excipients market is categorized into fillers & diluents, binders, suspending & viscosity agents, flavoring agents & sweeteners, coating agents, colorants, disintegrants, lubricants & glidants, preservatives, emulsifiers & solubilizers, and other functionalities. The fillers & diluents segment accounted for the largest share of the market in 2018. The large share of this segment can be attributed to the increasing use of fillers & diluents in the development & production of solid dosage form and the wide applications of diluents in the wet granulation & direct compression process for tablet formulation. The pharmaceutical excipients market in Argentina is expected to grow at the highest CAGR during the forecast period. The pharmaceutical excipients market in Argentina is mainly driven by the rising production & consumption of pharmaceutical products, large pool of domestic pharmaceutical manufacturers, rising pharmaceutical expenditure, growing investments by multinational market players in Argentina, growing production of biosimilar products, and rising burden of diseases. DowDuPont brings together the complementary portfolios of Dow and DuPont, making it one of the world’s largest chemical corporation. The acquisition of FMC’s Health & Nutrition business in November 2017 alleviated the company’s position in the global pharmaceutical excipients market bringing an extensive range of products under one roof. The company offers a comprehensive portfolio of excipients ranging from rheology modifiers, tablet coatings, controlled release, stabilizers, solubilizers, binding agents, and masking agents to name a few. The company is largely known for its diversified cellulose compound offerings for the pharmaceutical industry. Its position among the top five pharmaceutical excipient manufacturers is attributed to its global footprint through distributors and agents. The company is highly focused on conducting strategic agreements and expansions of its functional units. The company also pursues the strategy of agreements and partnerships with well-known science and technology universities to enhance its presence in the pharmaceutical excipients market. The company intends to strengthen its presence in the market by delivering superior solutions and choices to customers. The firm strongly believes that investments in R&D offer great potential for short and long-term growth. In 2018, Roquette launched the carbohydrate-based excipients—Maize Starch IP/BP and Mannitol IP. In 2017, DuPont acquired FMC Corporation’s Health & Nutrition business except for the Omega-3 business. With this acquisition, FMC’s Health & Nutrition segment will be integrated into the DuPont Nutrition & Health segment. It extends DuPont’s capabilities into the fast-growing pharma excipients space. In 2016, BASF signed an agreement with Colorcon (US) to sell its Kollicoat IR Coating Systems product line to Colorcon. This enabled the company to focus on its core competencies. However, the company will continue to develop and promote innovative film coating polymers including Kollicoat IR. How will the current technological trends affect the pharmaceutical excipients market in the long term? How is the market in the Latin American region progressing? The high growing functionality areas that can be tapped in the Latin America pharmaceutical excipients market? The secondary research process involves the widespread use of secondary sources, directories, databases (such as Bloomberg Businessweek, Factiva, and D&B Hoovers), white papers, annual reports, companies house documents, investor presentations, and SEC filings of companies. Secondary research was used to identify and collect information useful for the extensive, technical, market-oriented, and commercial study of the LATAM pharmaceutical excipients market. It was also used to obtain important information about the key players and market classification & segmentation according to industry trends to the bottom-most level, and key developments related to market and technology perspectives. A database of the key industry leaders was also prepared using secondary research. In the primary research process, various sources from both the supply and demand sides were interviewed to obtain qualitative and quantitative information for this report. The primary sources from the supply side include industry experts such as CEOs, vice presidents, marketing and sales directors, technology & innovation directors, and related key executives from various key companies and organizations operating in the pharmaceutical excipients market. The primary sources from the demand side include experts from drugs manufacturing companies and contract manufacturing organizations. Primary research was conducted to validate the market segmentation, identify key players in the market, and gather insights on key industry trends & key market dynamics. The market size estimates and forecasts provided in this study are derived through a mix of the bottom-up approach (segmental analysis of major segments) and top-down approach (assessment of utilization/adoption/penetration trends, by functionality and LATAM countries). 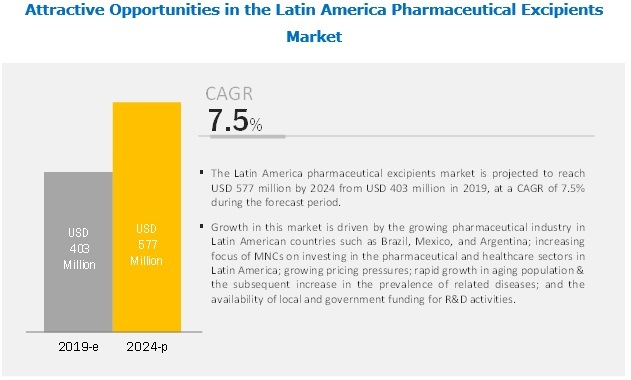 After arriving at the market size, the LATAM pharmaceutical excipients market was divided into several segments and subsegments. To complete the overall market engineering process and arrive at the exact statistics for all segments & subsegments, the data triangulation and market breakdown procedures were employed, wherever applicable. A further breakdown of the European pharmaceutical excipients market into Belgium, Netherlands, and Rest of Europe.